Forest & Bird said today the reported death of another Maui’s dolphin on the Taranaki coast underlines the tragic failure of the government to act fast enough to ensure the world’s rarest dolphin is saved from extinction. “The Minister of Primary Industries David Carter must use his emergency powers now to ensure there are no further deaths of Maui’s dolphins off the Taranaki coast. We are angry because he could have acted earlier,” Forest & Bird Marine Conservation Advocate Katrina Subedar said. The Fairfax news website Stuff today reported a source saying the dead Maui’s dolphin was found on Thursday or Friday on a beach near Pungarehu, south of New Plymouth. It was collected by the Department of Conservation and a call taker on DOC’s hotline confirmed the death, Stuff reported. In February, the death of a Maui’s dolphin in a fishing net off the Taranaki coast in January was belatedly confirmed by the government. Forest & Bird urged the Minister of Primary Industries to use his emergency powers to extend a ban on gill nets – the greatest threat to the dolphins – to include the Taranaki coast. “This latest death shows the tragic cost of failing to use these emergency powers. But the minister can still act now to prevent any further deaths,” Forest & Bird’s Marine Conservation Advocate Katrina Subedar said. Last month DOC’s latest population estimate showed there were only around 55 Maui’s dolphins left – excluding calves under a year old. This showed the population had declined drastically since a population estimate in 2004. News of the population fall was accompanied by a proposal from the Ministry of Agriculture and Forestry to extend a ban on gill nets around the Taranaki coast as an interim measure pending a review of protection measures. “These interim measures are not due to come into effect until mid to late May after a consultation. 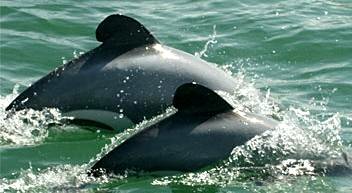 But the Maui’s dolphin population is on a knife edge and the minister needs to act now,” Katrina Subedar said. Although a useful first measure, the extension of the gill net ban to the Taranaki coast will not be enough to ensure the survival of Maui’s dolphins. The ban needs to be extended to all regions Maui’s dolphins may be found and needs to include all harbours and seas in those areas up to a depth of 100 metres. The current gill net prohibition area – excluding Taranaki – was put in place along most of the upper half of the North Island’s west coast in two stages over the last decade.